Cleveland Power and Performance is proud to present this rebuildable 2008 Dodge Viper SRT-10 Coupe! This is an extremely desirable vehicle due to the beautiful “Snakeskin Green” paint, new to 2008 600HP 8.4L engine, and coupe body style! This Viper has only 10K miles on it! This is your chance to save thousands on a beautiful and rare Dodge Viper, or to get the perfect donor for your Mopar restomod. This is one of only 241 Snakeskin Green coupes produced in 2008! We purchased this Viper after it was involved in a rear end collision. The rear rails need repaired, as you can see from the photos. No air bags deployed in the collision. 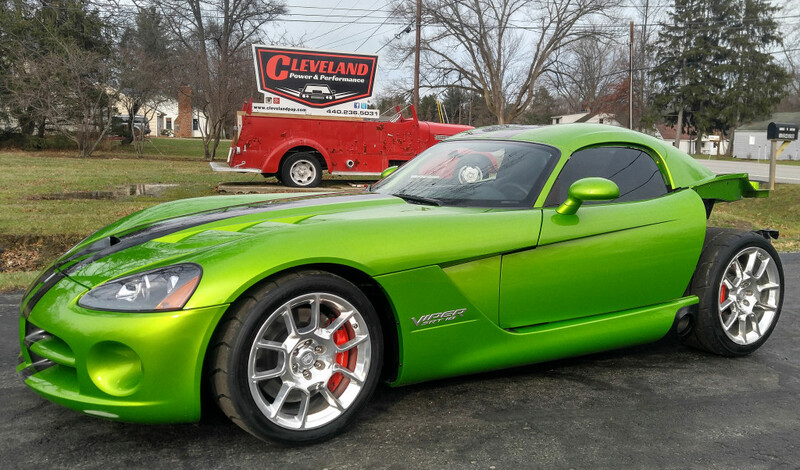 This Viper is being sold with an Ohio salvage title. This 2008 Viper SRT features the awesome 8.4L 505CI V10 engine which produces 600HP and 570ft-lbs of torque! Mated to the 8.4L, putting the power to the wheels, is the Tremec TR6060 transmission. This Viper has the new to 2008 GKN Visco-Lok 3.07 ratio differential. This Viper is equipped with driver’s power and passenger manual black leather and suede seats. This viper also features a navigation radio. This Viper is sitting on four OEM 10 spoke polished “Razor” wheels. The fronts are 18″x10″ and are wrapped in 275/35/18 Nitto NT01 tires. The rears are 19″x13″ and are wrapped in 345/35/19 Nitto NT05R tires. The right hand rear wheel is bent, but does hold air. This Viper is Snakeskin Green and features custom snake scale pattern racing stripes. Please see the photos below to judge paint and tread condition. Please also make sure to scroll down to see underside photos of the vehicle. We will include the loose parts that came in with this Viper. These are various damaged exterior pieces and some interior pieces. Please make sure to scroll down to the bottom photos to see these parts.